May 22, 2010 by Alphageek in "alphageek bourbon red stag jim beam kentucky"
This is a post that took a while. I was waiting to post until the new Alphageek Headquarters was ready for occupation. It took several months, but the new facilities are finally coming along nicely. There is a new network, a new desk and a wonderful view of the woods. This environment makes for a wonderful place to have a bourbon and contemplate about the HQ. However, the opening of the HQ was not the only thing that had to happen before this article could be written. Every bourbon thought is accompanied by some sort of photograph that I took myself. This combination gives me a way to give myself a reason to take some photographs. This series of photos has several new techniques involved that I wanted to run through as well. Hey, its my thoughts, not yours. Given my rather brief bourbon reviews, I need something to make stopping by here worth the trip. I decided this was a great chance to use the new basement to take some pictures. I got everything together in what seemed like a short amount of time. As I was setting up, I noticed that my black background was damaged. I decided to break out the silver one that I had for some time, but never used. I then decided I wanted to use the remote release I got for Christmas, instead of shaking the camera with my fingers. The release made pictures a lot easier to take. My final thought was to use the gray card that I got for Christmas as well. The basic process is to take a picture with the gray card in the picture, and use that picture to calibrate the other pictures to remove the unusual colors that the cheap lights I use can cause. I am extremely pleased that the picture you see has no hint of the yellow that previously haunted it, and is now a bright silver background, with a properly colored bottle on the picture. I am somewhat unhappy with the focus, but I was getting tired of trying to figure out what is going on. I think the silver metallic background may be throwing the camera off. Unlike the focus, I think the colors are amazingly accurate. Picture taken, I sat down in the HQ to sample the bourbon. I am a little uncertain about combining bourbon with cherry flavor, as Red Stag does.. I would like it to be known that I am a purist when it comes to just about everything. I also believe rules are supposed to be broken if you want to ever really make anything happen. Which side will win out? Let's find out. I open the bottle an notice that the cap is metal. I wonder when is the last time I had bourbon with a metal cap? I take in the aroma and one thing is certain, I like the nose of this combination. I pour myself about two fingers worth. The aroma now fills the room. I think it smells even better in the glass. I take my first sip, and the sip is not at all what I expected. 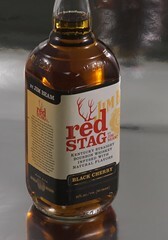 The addition of the of the cherry flavoring gives Red Stag an almost liqueur like quality. I had to check the label again and make certain that the proof was not lower than usual. I take another sip and decide that this drink, while not the purist's bourbon, is certainly a good drink. I think Red Stag is in a unique place right now. It is easy on the palate with a unique, smooth quality and syrupy body that makes it a very enjoyable experience. I would like to thank Rulinbarb (I don't use real names here, so I picked one for you) and Common Man for the suggestion to try this unusual, but enjoyable drink. "alphageek bourbon red stag jim beam kentucky"